The Thrombus Innovation Awards showcase innovative projects that demonstrate sustainability and excellence and have improved services in the field of thrombosis. The 2013 ceremony was held on 7 February 2014 at BMA House in London, with three prizes of £3,000, £1,500 and £750 presented by Peter Rose, Editor of Thrombus and Consultant Haematologist at Warwick Hospital. To find out more about the winning entries, download the Awards supplement. Or watch Dr Andrew Hughes, the project lead for the winning team, explain more about their entry. 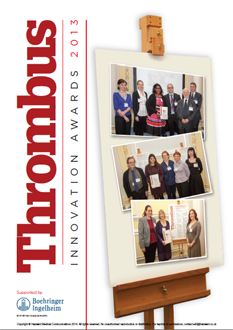 The 2013 Thrombus Innovation Awards were organised by Hayward Medical Communications and supported by Boehringer Ingelheim Ltd.